Here are a few photos from Cup Day. I have drawn the winner for the Cup Day Competition! I have sent the winner an email. Congratulations! Thanks to everybody who entered. Cup Day 2009 update – How to get a badge. To enter the competition to win me as your personal Cup Day photographer, you need to buy a badge ($10) before 20th October. You can buy one when you see me on the street, or, email me (iain*at*iainfergusson.co.nz) and I will give you my bank account number so you can transfer the money to my account, and then I will send you your badge by good ol’ snail mail. 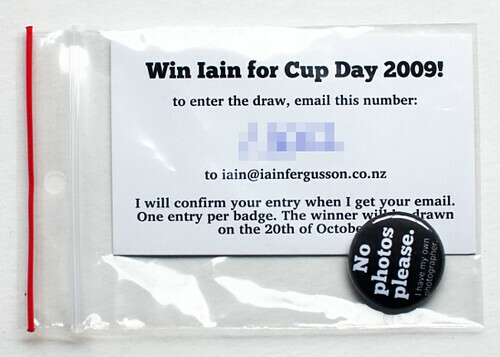 Cup Day 2009 – One badge ready to go. One badge ready to go., originally uploaded by Iain Fergusson. I’ll have a bunch of these with me when I am out this weekend. If you want one just ask me.They are $10 each. I’m not sure this is the best plan because it might get lost. Anybody got any better ideas for me to get them to you? 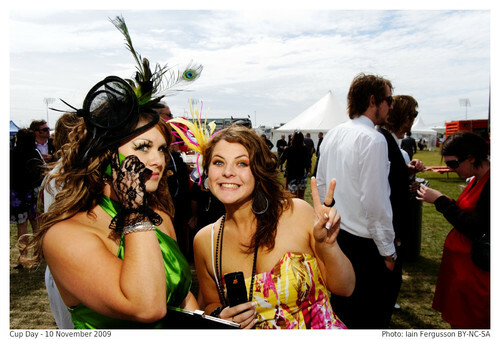 Cup day is not too far away, and you can win me as your personal photographer. I am ordering 150 badges that say “No photos please. I have my own photographer.” If you buy a badge you can enter the draw to win my services as your photographer for cup day (Tuesday 10th November). One entry per badge. Badges will be $10. I will draw the winner on the 20th of October. I know Cup Day is ages away, but I am scheming about what to do for it. I thought a raffle, with the prize of me as your photographer for the day, was a splendid idea. Raffles, however, are technically gambling, and have quite strict requirements for anything over $500 turnover. So a raffle is more trouble than it is worth. I’m still thinking about having some kind of competition though. Stay tuned!